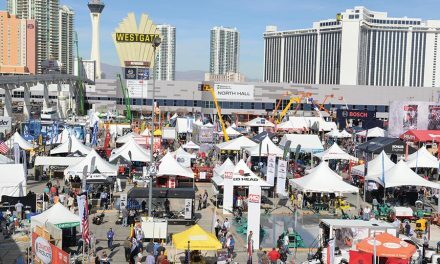 In talking with ICF exhibitors at this year’s World of Concrete exposition, the question was raised about typical wall thicknesses being used in the regions wherein they merchandised ICF forms. In general, the consensus was that engineers were not consistent in their designs of such walls. Several instances were cited where structural engineers had designed reinforced concrete walls well in excess of four inches thick for ordinary home construction. Yet the same engineers might allow a four inch wood frame wall. This article will address the structural considerations for safe reinforced concrete wall thicknesses and not necessarily construction practicalities. Keeping in mind that ICFs are only the forms into which concrete is deposited in order to create a structural wall, it should be recognized that the forms contribute negligible strength to the walls. In other words, the walls are being constructed with cast-in-place reinforced concrete (R/C) regardless of how they are formed. So this article will highlight the structural contributions of the R/C elements. This raises the question as to how thick should such walls be in order to carry out their structural function under loads. The thinnest walls will likely be limited to about four inches. This is a condition imposed by the practicality of getting the concrete into the forms and around the reinforcing steel without excess blockage and honey combing. It is conceivable that even thinner R/C walls might be structurally sound if the problem of successfully placing concrete can be resolved. Using conventional structural analysis practices, the writers decided to investigate the question of how thick should the R/C walls be to stand up to the forces of nature. 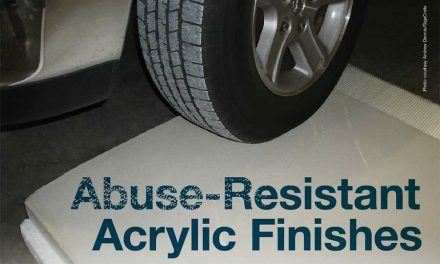 Free standing R/C walls are limited in their abilities to resist lateral forces since they are anchored only at their bases. Replacing a wood-framed roof with a structural concrete slab roof, flat or pitched, provides significantly more rigid support for the tops of the walls. Such roofs can be constructed with ICF roof plank elements already perfected and on the market. ICF technology for R/C roofs is a relatively recent development. It is dependent upon the support provided by R/C walls. There is not yet a sufficient number of concrete roofs to set a trend, but the authors believe that as ICF technology for concrete roofs matures that such roofs will become competitive with wood truss roofs when life costs are compared. This will be especially true when designers discover and demonstrate such concrete roofs may not necessarily require covering with conventional roofing materials. Properly tied together with a concrete roof, the structure no longer consists of walls only but becomes a structural shell or box with exponentially greater strength because of the rigid diaphragm action of the roof elements providing support to the tops of the walls in both the x and y directions. For the purpose of this article, it is expected that a disaster-resistant shell house will feature flat or pitched reinforced concrete roof slabs structurally connected to the concrete walls. 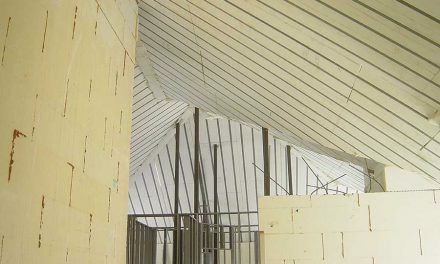 It is incomprehensible that homebuilders continue to install wood framed roof assemblies to secure R/C walls expected to handle very high wind velocities. Such a roof would be distributed by a tornado in the form of kindling wood over many acres. The interior of the decapitated house along with its contents and inhabitants would then be at the complete mercy of the subsequent weather. In the major Kobe, Japan earthquake of 1995, the world saw photos of extensive damage to buildings and transportation structures and learned about the deaths attributable to the event. Thirty-nine mid-rise box-frame precast reinforced concrete apartment buildings were located within the zone of influence of the 6.8 Kobe trembler. There was no structural damage to a single apartment building from the quake and they were all green-tagged for immediate occupancy the day after the shake – confirming the viability of the box-frame structural solution. 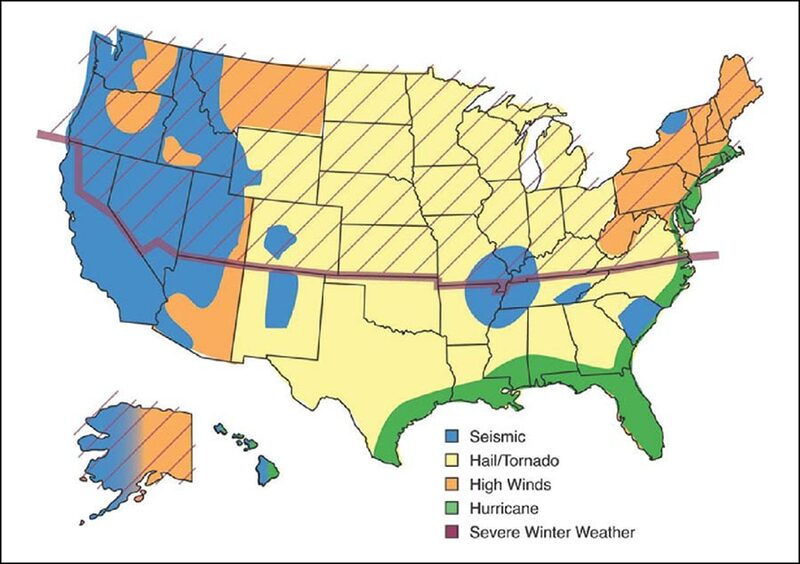 The disaster map below shows that most of the continental USA is subject to damaging forces of nature of one type or another, especially high velocity winds. As a possible worst-case scenario, we have calculated the lateral loads which might be applied to a house by a tornado wind velocity of 350 mph (563 kph). Although the U.S. National Weather Service has estimated that tornado winds may reach a velocity of 500 mph (800 kph), the highest tornado wind speeds ever documented, 318 mph (516 kph), were measured using Doppler radar during a tornado in Oklahoma in 1999. Such a wind velocity might occur in the event of a severe tornado and is notably in excess of winds experienced in hurricanes (Atlantic), typhoons (Pacific) and cyclones (Indian Ocean). 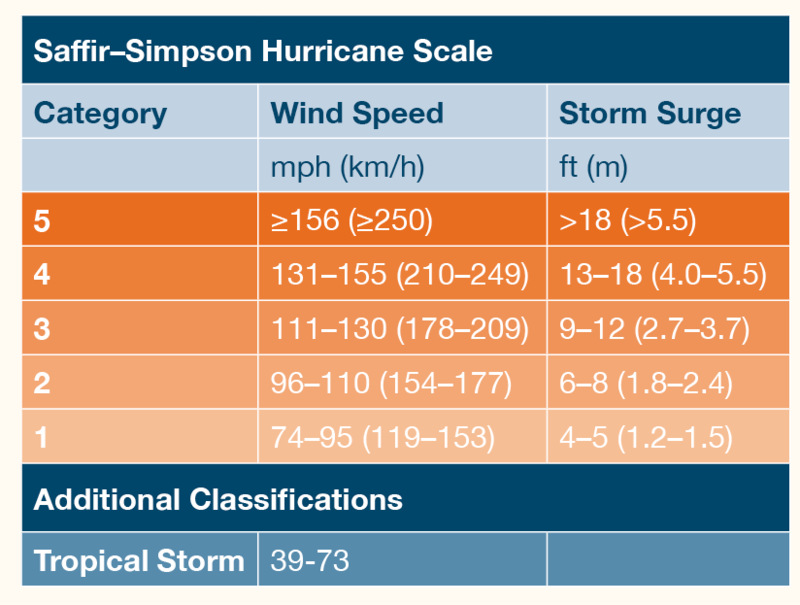 A classification of hurricanes has been instituted based on the Saffir-Simpson rating scale. The Saffir-Simpson scale is a standard scale for rating the severity of hurricanes as a measure of the damage they cause and it is based upon observations of numerous North Atlantic Basin hurricanes. 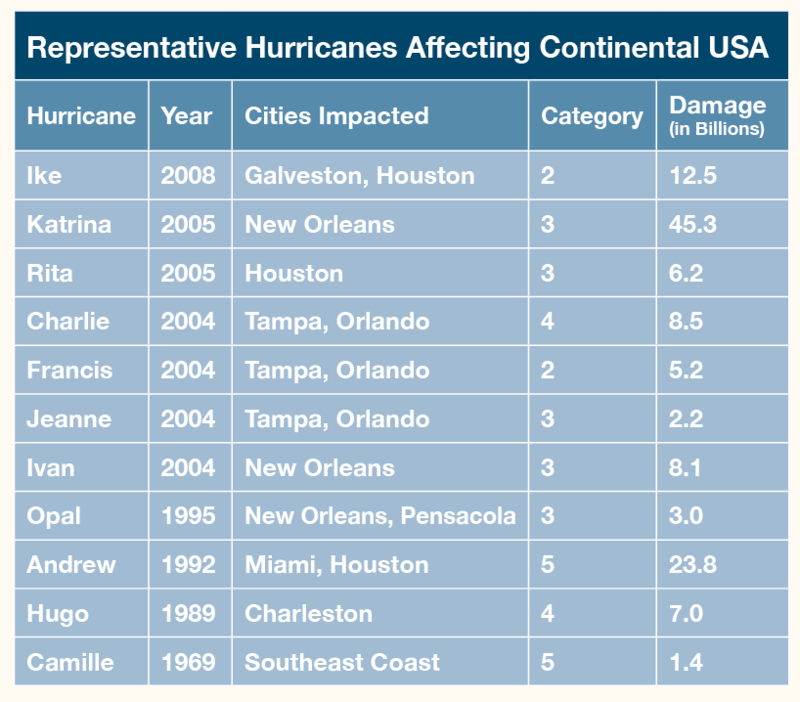 The following tabulation was easily accessed and assembled from websites relating to hurricanes. There are numerous photographs of the devastation caused by water and high winds for each of these storms. Almost without exception, wood frame roofs are severely damaged and even missing. And yet, incredibly, when the houses are rebuilt, designers again install wood-frame roofs and the code bodies allow them to do it. Home insurance companies seem not to be aware that another type of roof system is available that is not only structurally superior in capability to resist severe forces generated by nature, but at the same time is fire-proof, vermin-proof, termite-proof and mold-proof – all of them being hazards that the insurance industry is uniquely familiar with. If the structural design for a house is based on 350 mph (563 kph) tornado-generated wind forces, then it should be more than adequate to meet the lesser requirements for hurricane winds as outlined in the table on the previous page. Calculations made for this article show that tornado forces of this magnitude will also govern over the criteria for an International Building Code (IBC) mandated maximum seismic loading. Copies of the structural engineering calculation sheets for the studies which are the basis for the conclusions in this article are available for download at the ICF Builder magazine website. 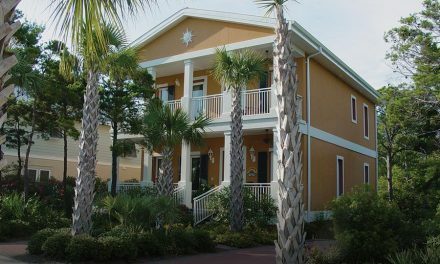 They were performed for a hypothetical single family residence to demonstrate that 4” concrete walls can be designed to resist the extreme loads discussed in this article. They are not intended to serve as a design guideline and should not be used as such. As a demonstration for users and designers of reinforced concrete homes, the writers evaluated the resistance to nature-imposed forces by single family homes with 4 inch reinforced concrete walls and structural concrete roofs. Completed concrete shell buildings consisting of reinforced concrete roofs, floors and 4 inch concrete exterior load-bearing walls were evaluated. Forces exerted by 350 mph (563 kph) winds as well as a maximum credible earthquake anywhere on earth were imposed on the building using the 2006 International Building Code and ASCE Standard 7-05 design criteria. The walls were designed using design provisions of the ACI 318-05 Code and Commentary. Structural analysis with design criteria for residential structures, using the referenced codes and standards, demonstrates that 4” thick reinforced concrete exterior shear walls for such structures can be designed to provide acceptable resistance for forces resulting from 350 mph winds and a Maximum Credible Earthquake. The size and spacing of steel reinforcing required is reasonable at all locations from a cost and constructability viewpoint. No reason is apparent for designing such structures with walls thicker than 4” if reasonable lengths of wall are available at all exterior elevations of the building. There are some fairly reliable shuttering systems for hurricane winds, but none have been developed specifically to provide much protection during such a strong tornado. While it is likely that all of the conventional windows and doors of a house subjected to a tornado would be demolished, the house would still be standing structurally sound after the storm and would offer practicable salvage value for rebuilding. Some might label this “sustainability” for real.